I recently had a delightful opportunity to join Houston area mommy bloggers for a get-together, kindly hosted by Formula Mom. I was thrilled to be able to meet her and she was just wonderful. One of the nicest people I have ever met, so down to earth. We watched our children play, with plenty of toys and snacks to keep them entertained, while we moms indulged in some much-needed comparing of mommy notes. I owe all my ingenious tactics to other moms! We gathered together to discuss and share with one another our experience with White Cloud diapers. The group was unanimously in agreement that White Cloud diapers offer comfortable protection for our babes at a price that doesn’t break the bank. While there is nothing generic in the quality of White Cloud diapers, they are competively priced and can be found at your local Wal-Mart stores. I'm not typically a brand snob. With diapering, I find that I’m loyal to what works well with the cheapest price, whatever the brand. With that, however, I have to be honest and tell you that I had never used White Could Diapers before. I presumed they would not meet my standards, and boy did I walk away that day feeling better informed about my options. Since the event, I’ve been using White Cloud diapers with our 1-year old (size 3), and I admit…I’m impressed. They look and feel just like their name brand competitors, with a much lower price tag. Most importantly, to me, they are cottony soft, fragrance free, hypo-allergenic and consist of stretchy sides that make for a perfect fit. The smaller sized (newborn-2) have an extra soft quilted inner liner that will help keep messes under control. Additionally, these sizes have a built in wetness indicator for convenience. See, all the amenities of the diapers you have grown to love! 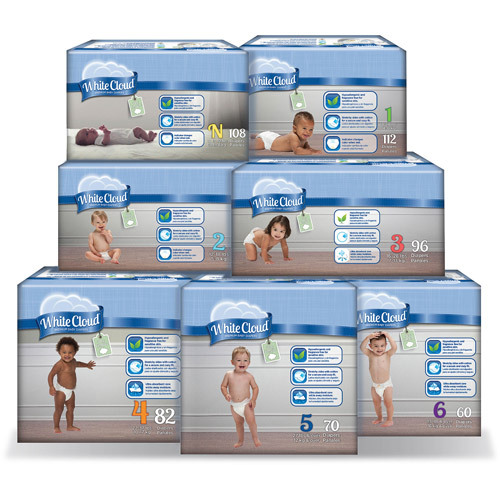 White Cloud Diapers provide your baby the highest quality diaper with superior leakage protection, exceptional softness and great fit. White Cloud Diapers are available exclusively at Wal-mart, where you can find low prices everyday on all your family’s needs. How do these hold up next to Huggies? I used to use a lot of the store-brand variety diapers, but when my first child got to that Size 3 mark he started making such a mess that it leaked all over the place (ewwwwwww). So I switched to a name-brand out of fear for my clothes lol. I've been using cloth diapers on my newest one, but I'm quickly finding out that the bigger she gets, the more difficult it is to cloth-diaper, so we might be going back to disposables at least part-time! Hi Alicia -- it's lovely to have you here at AMHE! White Cloud diapers are thinner than Huggies, but surprisingly do what they promise to do! We've not had any leaks while wearing them. I've not used White Cloud night time diapers (or know if they even exist), so we remain loyal to Huggies in that regard. Yeah one of the best reason due to which honest co diapers is the best in the market is because it is easily adapt to baby's shape making them more comfortable when moving around and also gives them great support to move around freely and comfortably.